On November 16, 2017, JUMP sponsored a panel discussion and reception at the National War College in Washington, D.C. on “Persistent Challenges for the Northeast Asia Region: Japan, China, the Korean Peninsula, and U.S. Perspectives.” The event, which was co-sponsored by the Japan-America Society of Washington DC, the National Association of Japan-America Societies, and the Embassy of Japan in Washington, D.C., brought together experts on Japan, China, and the Korean peninsula for an engaging discussion on the U.S.-Japan alliance, China’s strategic priorities in the Asia-Pacific, and the continued threat from North Korea. About 150 people from a range of fields attended the talk and the reception which followed it, including high-ranking members of the military, professors, students, and experts on Northeast Asia politics and security. The event kicked off with welcoming remarks from Brigadier General Chad T. Manske, USAF, Commandant of the National War College, and General Yoshiki Adachi of the Defense Attache of the Embassy of Japan, and a keynote address from Ambassador James Zumwalt, CEO of Sasakawa USA. General Manske mentioned the significance of the National War College in his remarks, while General Adachi discussed the value of the U.S.-Japan alliance in Northeast Asia’s security. Ambassador Zumwalt’s address highlighted the depth of relations between the U.S. and Japan as seen in the two countries’ economic ties and more. A panel discussion followed these remarks, with Sheila Smith, Senior Fellow for Japan Studies at the Council on Foreign Relations, Bruce Klingner, Senior Research Fellow for Northeast Asia at the Heritage Foundation, Bonnie Glaser, Senior Advisor for Asia & Director of the China Power Project at the Center for Strategic and International Studies, and Lt. Gen Chip Gregson Jr. (ret. ), Senior Advisor of Avascent Global Advisors, as panelists. Dr. Cynthia Watson, Professor of Strategy at the National War College, moderated the discussion. The panelists spoke about recent developments in Northeast Asia, including Japan’s Diet lower house election in October, China’s 19th Party Congress, and North Korea’s continued missile tests. An audience Q&A session followed, in which panelists were asked about U.S. military capabilities and the proliferation of nuclear weapons in Northeast Asia. The event concluded with remarks by Gene Russell, Executive Director of the National War College Alumni Association, and a toast by Matthew Goodman, Senior Advisor for Asian Economics at the Center for Strategic and International Studies. 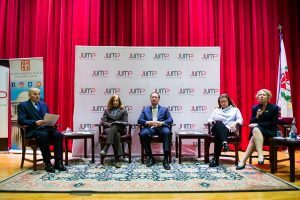 Interested in attending future JUMP events and panel discussions? Sign up for the JUMP newsletter today for the latest JUMP news and info on upcoming events!